Dougie Freeman started the West End Salon in 1983. The West End Salon and Spa is getting ready for a busy summer when they typically will be open from morning until late night every day. When I stopped in for a haircut and a few highlights the other day they were in the midst of ordering new towels for the salon and new sheets for the spa, getting ready for the summer crowds. Whether you want to enhance your health and well-being or improve your image, or simply to look your best for a special occasion, there are highly trained experts here who will offer you a wide variety of treatments and services that will simply make you look and feel great. Entire wedding parties will book the West End Salon for hair and makeup for their big day. 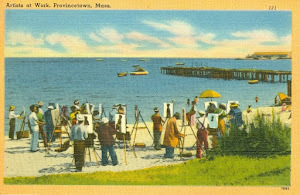 Folks who regularly vacation in PTown return to the salon each summer as well for a relaxing massage using a variety of techniques, or for a facial, a cut and style, or for a whole new look. You can be invigorated or relaxed, get a paraffin treatment or a salt scrub, have a manicure, pedicure or any number of other professional treatments and services. You can get get a spray tan, henna or glitter tattoos, or full-color airbrushed body art done by the expert staff at the West End Salon and Spa. Click on this link to visit the West End Salon online or dial 508 487-1872 for an appointment. 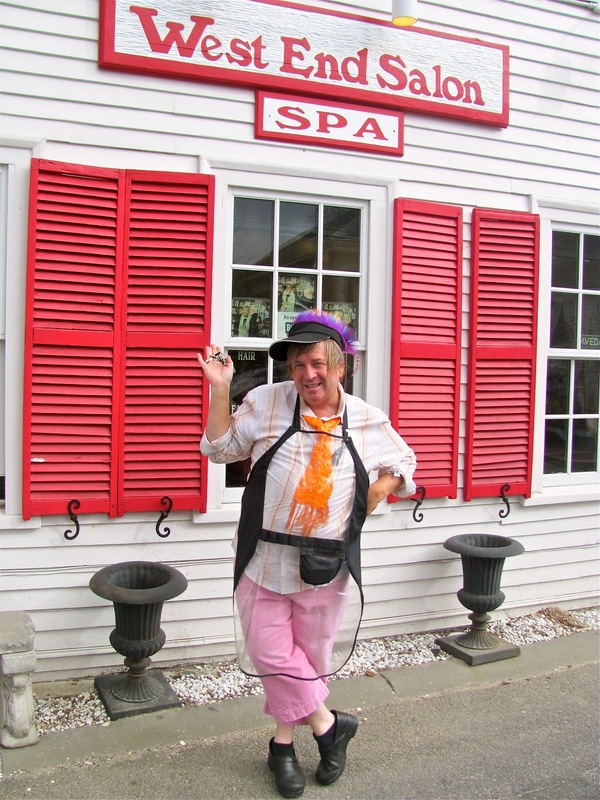 You can also just drop in at 155 Commercial Street to find out more about their many services, or to congratulate Dougie on the upcoming 30th anniversary of the award-winning little salon he started in Provincetown's West End way back in 1983. More later about their colorful history and coming anniversary. For now, stop in and do something nice for yourself. You deserve it. My first meal at the Coffee Pot this year was the Denver Omelet. The Coffee Pot, at Lopes Square, has reopened for the season, serving breakfast and lunch (and supper, once the season kicks in) from a menu that has greatly expanded over the years. I went for breakfast the other day and had a Denver Omelet with potatoes, wheat toast, butter and jelly for $10. Grilling the ham, onions and peppers before stuffing them into the eggs along with the cheese made this one of the tastiest omelets I've had in quite some time. Remember when this place started out? For years it was just a very friendly little hole-in-the-wall serving coffee and fresh baked muffins and bagels and such, slipped into a paper bag to go. Well, if you haven't noticed, the menu has expanded by leaps and bounds, and awhile back they knocked down a wall to make room for tables and added a small bar where beer and wine are now served seasonally as well. You'll still order at the counter, but now you have the choice of sitting indoors or out with fresh, tasty food for any time of day, once the season really begins. It will be a few more weeks until you can get fish and chips at dinner time, but you can get them for lunch, or a number of other meal specials that rotate daily. Check the blackboard as you walk in. There are soups, salads, grilled panini sandwiches, burgers, and some of the best French fries in town. There are a few ethnic influences as well, like the Gyro (choice of chicken or the traditional lamb) or the Cuban sandwich. Try the Asian Chicken Salad, or the Santa Fe Wrap, made with chicken, black beans, salsa, lettuce and dressing. They still do a big takeout business, too, particularly in the morning when fresh baked goods are coming out of the oven and Townies are streaming in for their morning coffee and a breakfast sandwich to inhale on their way to work. I usually call ahead for a bacon, egg and cheese croissant, or a breakfast burrito (eggs, cheese and salsa wrapped in a tortilla) or a dozen other choices and combinations. 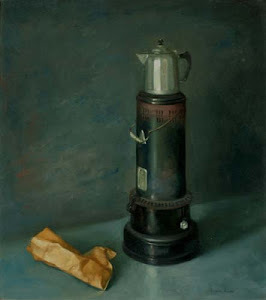 Call the Coffee Pot at 508 487-2580, and by the time you get there your breakfast will probably be ready to grab-and-go. Right now they are open daily from about 6:30 AM till around 5 or 6PM, if it's busy enough to stay open. At the height of the summer they'll be open 5:30 AM till around 10 PM. We welcome back Linda and Nelson and the gang for their 25th season in PTown. 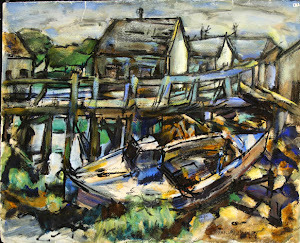 The Pilgrim Monument and Provincetown Museum (PMPM,) once again welcomes visitors as their 2013 season gets under way with an exciting new exhibit in the East Gallery. A private collection of Eastern Rig Dragger boat models, built in 1/24 scale by late Truro resident Alfred J. Silva, Sr., is now on display. 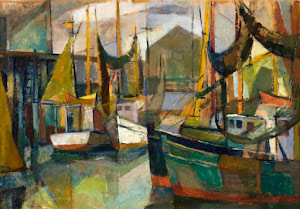 Born in Provincetown, Mr. Silva knew the local fishing fleet intimately, building tremendous detail into his models of boats that sailed in the Provincetown fleet from around 1950 to 1972. 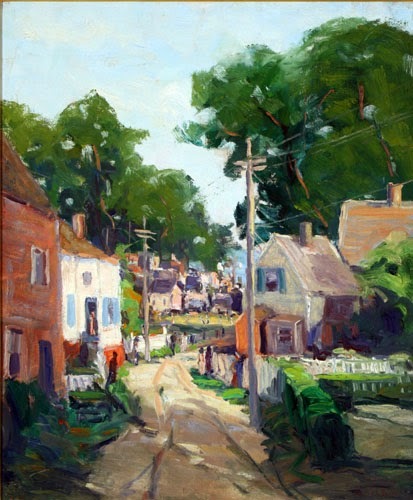 Also featured are works of art by Provincetown artists Sal Del Deo, born 1928; Nancy Whorf, 1930 - 2009; and Arthur Cohen, 1928 - 2012. 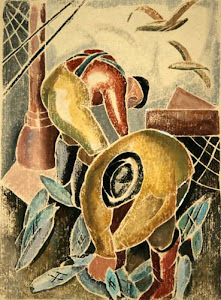 You'll find more on Arthur Cohen in the column of artists running down the right-hand edge of this page. For a spectacular view for miles in all directions, you can climb to the top of the Pilgrim Monument, the tallest all-granite structure in the country, at 252 1/2 feet tall. It is perched on a hill that stands 90 feet above the harbor as well, so the view is superb. This is one of the great Photo Ops of Provincetown, so remember to take your camera with you, and a sweater for the breeze. Even if you don'y want to climb the monument, which takes the average person about ten minutes, from the lovely grounds at the base of the monument you'll have a splendid view of the harbor. The museum at the base of the monument is well worth a visit as well. Learn about the Pilgrims first landing, the early theater days of Eugene O'Neill, Tennessee Williams and others, important artists, the whaling and shipwreck days and much, much more. The gift shop there has some nice souvenirs of your visit and a wonderful variety of books about Provincetown history and lore. At this time of the year PMPM is open from 9 AM to 5 PM, with their last admission for the day at 4:30 PM. The hours will be extended to 7 PM from Memorial Day to Labor Day, with last admissions at 6:30 PM. You'll find it in the center of town, at the top of High Pole Hill. You can walk up the hill, or there is paid parking available on the grounds, as well as wheel chair access. Enjoy your visit. A walk or ride through the dunes is a perfect way to celebrate Earth Day. 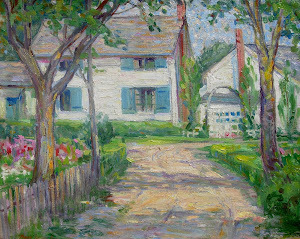 What better way to celebrate Earth Day than with a walk in any direction, from any part of PTown? From the East End you can stroll out into the dunes from the tiny parking area on Route 6, across from Snail Road, for one of the most amazing walks on the planet. 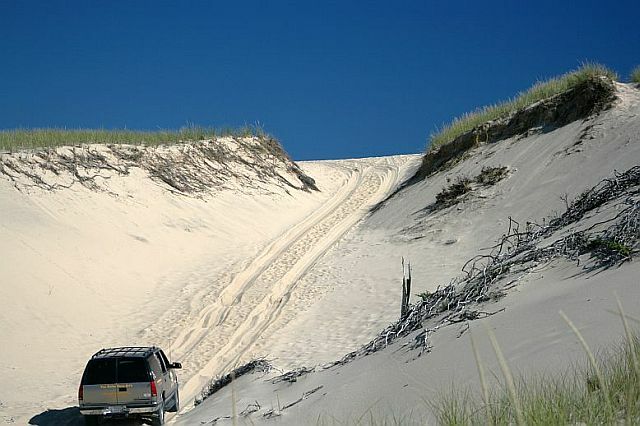 You could also get out into the dunes by taking Art's Dune Tours, which began operating a week ago, taking folks on an hour-long narrated tour of the dunes and its forested patches, with a drive along the edge of Race Point Beach if conditions allow. Call them at 508 487-1950 to arrange a tour. From anywhere along Commercial Street you'll easily find your way down to the beach along the edge of the harbor. Just look for a Town Landing or other public walkway to the beach, like the path alongside the Whalers Wharf, or the walkway through the building. Along Commercial Street you'll find at least 18 Town Landings and public walkways or footpaths at the foot of many of the side streets that meet Commercial Street. These little thoroughfares lead down to the edge of the water, and when the tide is right you can walk along the beach from any of these spots:. At one end of Snail Road you can walk out into the dunes, and at the other end of the road you can walk along the beach and the harbor, and halfway between these two points is the old railroad bed, leading you off Snail Road for a walk in the woods. At Howland Street, opposite Harry Kemp Way, there's another trail out into a wooded area. 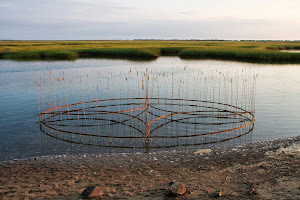 There are nearly 8 miles of bike trails leading out through the Cape Cod National Seashore, perfect for walking as well, and many other trails leading to ponds, conservation areas, Hatch's Harbor and other beautiful destinations. 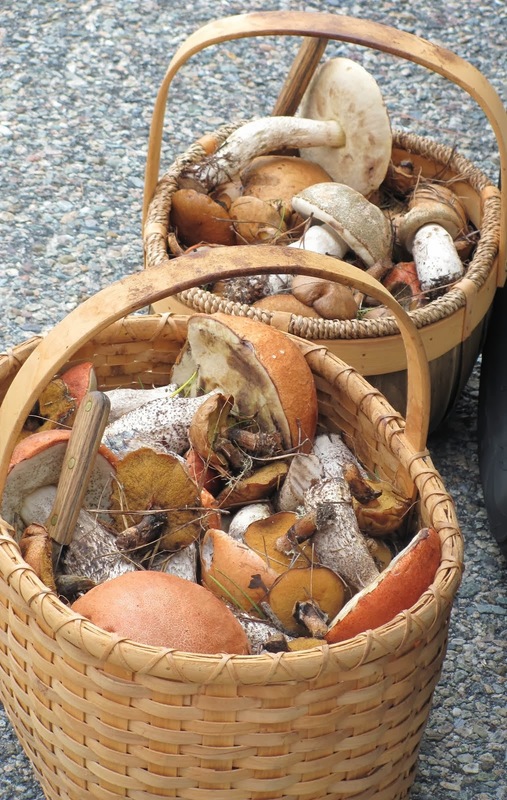 Of course, you can walk at Herring Cove or Race Point beaches. Take the stroll on the boardwalk that leads to the Old Harbor Life-Saving Station at Race Point Beach and spend a little time watching for whales off the shoreline. Get out for a walk somewhere and celebrate Earth Day, whether you are able to do it today or over the next week. And if you tuck a plastic bag into your pocket, you're ready to pick up any bits of trash or treasure you might find along the way. appears on the 1920 Pilgrim Tercentenary half dollar. In May of 1920 the U. S. Congress authorized the minting of a coin that would commemorate the 300th anniversary of the arrival of the Mayflower Pilgrims on what would eventually be known as American soil. Boston sculptor Cyrus E. Dallin, known for his Appeal to the Great Spirit, a statue of a Native American on horseback which can be seen at Boston’s Museum of Fine Arts, was engaged to design the coin. In fact, the design of this fifty-cent piece may have been rushed a bit since the anniversary year was already half over when the notion (and then the motion) to create this new coin was approved. That may explain a few errors in the design, such as the shape of the Mayflower, on the back of the coin, along with the type of sails and their placement on the masts, making this ship look a bit more like the Santa Maria, the ship that carried Columbus to the Bahamas (not to American shores) in 1492. Pilgrims' journey to religious freedom in the New World. 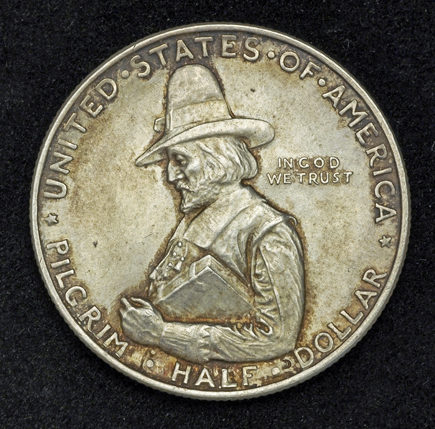 The front side of the coin portrays William Bradford, the leader of the Pilgrims, who would become the governor of the Plymouth Colony and serve in that position, on-and-off, for close to 30 years. In designing the coin, Dallin invented the image of Bradford, as no known drawing of his actual likeness exists. He gave Bradford the sort of features and clothing often seen in paintings by Dutch Masters of the 1600s. Actually, most of the Pilgrims typically dressed a bit less formally rather than in the staid styles and dark colors in which they have most often been depicted over the years. Historians will argue as to whether the book Bradford holds is a Bible or his own book, Of Plymouth Plantation, in which he details a good bit of the history of Plymouth and its people, as well as conditions and events that led 102 souls to leave their homes in England and Holland for an uncertain life in the New World. This book is where we find a great deal of our knowledge today of the journey, the lives and the struggles of the Pilgrims. In 1920 there were 152,112 of these commemorative coins minted. Today they typically sell for about $60 to $90, depending on their condition. Half-dollar coins have been churned out nearly every year since the first U.S. Mint was built in 1792, in Philadelphia, which was the nation's capitol at the time. Should we begin lobbying Congress for a 2020 quatercentenary coin acknowledging Provincetown as the Pilgrims' first landing place? 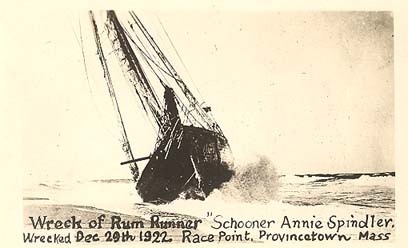 On the morning of December 29th, 1922, the British Schooner Annie L. Spindler, sailing out of Yarmouth, in the Canadian maritime province of Nova Scotia, ran aground on the shoreline of Race Point Beach. The ship, dubbed "The Rum Runner" by those who knew her, came ashore almost exactly in front of the U. S. Coast Guard Station at Race Point, carrying what else but around 600 cases of Canadian Whiskey! A lookout on duty at the station had spotted the vessel some ten minutes before she struck the shoreline. A terrible storm had churned up the waters, and the lookout could see that the ship's captain and his crew of five men had lashed themselves to the ship's rigging to keep from being swept overboard as the ship was tossed about by the enormous waves pushing it ever closer to the shoreline, its distress signals flying. The seas were too rough to launch the surf boat to rescue the ship's crew, so Coast Guard Captain Irving Collins used a small canon called a Lyle gun to shoot a line out over the bow of the ship, and a breeches buoy was set up to rescue one man at a time as the pounding waves began slowly breaking the ship apart. 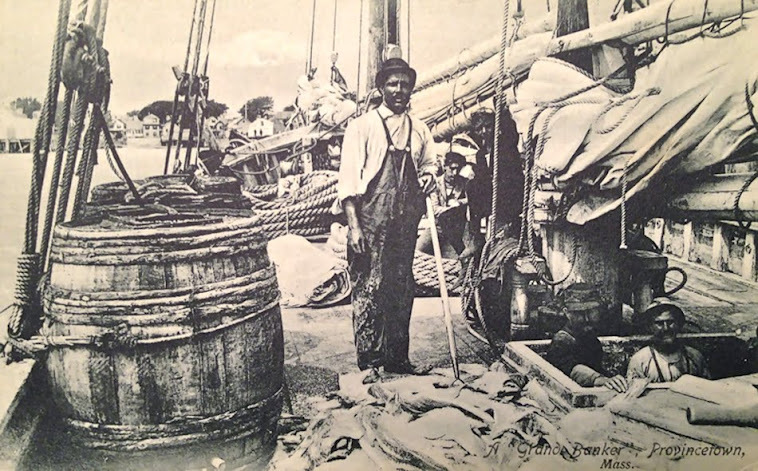 Picture a rope pulled taught between the mast of the ship and a crew of men on the shore, with a lifesaving ring, or buoy, hanging like a doughnut floating in the fryer, from a pulley attached to that rope. Got the picture? 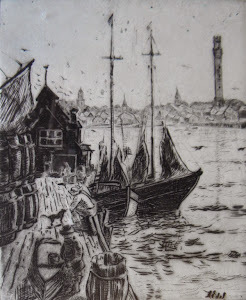 Now imagine a pair of breeches (a pair of pants,) attached to the buoy as if it were a huge waistband for the pants, which were hanging beneath the buoy, with the legs dangling in mid air. One at a time, a man on the ship would climb into that pair of pants, with the buoy circling his waist, and be pulled ashore by the crew of men on the beach. This breeches buoy, or beach apparatus, as it was sometimes called, was used to save the lives of hundreds of sailors over the years. Click the following link to see a four minute movie showing how the breeches buoy worked. 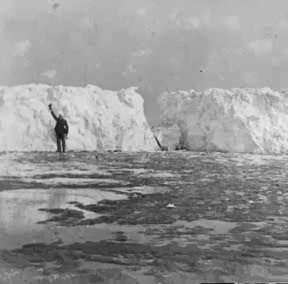 Despite the snow flurries in the air that day, and the bitterly cold wind from the north, local people gathered on the beach by the hundreds all day long, watching as the receding tide left the ship lying broadside on the beach, completely out of the water, as the waves continued to thunder ashore and slowly dismantle the ship. This was in the early days of Prohibition in the United States, when it was illegal in this country to manufacture or distribute alcohol. Some of the folks gathered on the shoreline cared less about the rescue of the ship's crew than they did about the possibility of getting their hands on a case or two of whiskey, but no such luck, apparently. According to one account I read, they all went home empty-handed after spending most of the day waiting for cases of whiskey to be washed out of the hold of the ship, all the while trying to keep themselves warm against the winds and the storm. I've read legends about folks rowing or even swimming out after cases of whiskey bobbing on the waves, which seems rather unlikely given the severe weather and dangerous seas that day. 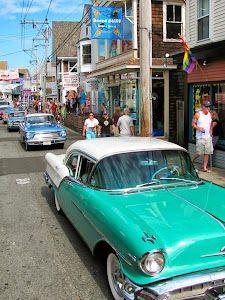 Of course, after all, this was Provincetown, so anything might have been possible. Another report mentioned a couple of hundred cases of recovered whiskey stored in a sort of warehouse shed while the Coast Guard, courts, and customs service determined what should be done with the contraband, but when the shed was opened following the proceedings, all but a few cases of that good Canadian whiskey had mysteriously disappeared. Other accounts I read raised the ships cargo of whiskey to some 800 cases, and one told of a house-to-house search by the authorities, looking for any sign of the purloined hootch, with not a single bottle being found. 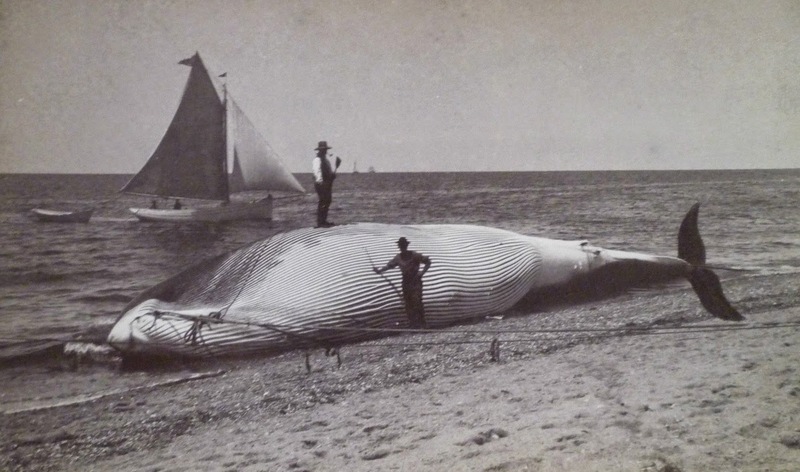 Of course, Provincetown fishermen and their families were all certainly clever enough to have hidden a few bottles where they would never be discovered. I'll write more about the rum runners, shipwrecks, and the early U.S. Life-Saving Service, which evolved into today's Coast Guard, in future posts. Meanwhile, read the original New York Times article on the wreck of the Annie L Spindler here. Townies and visitors alike are rejoicing as the Lobster Pot, at 321 Commercial Street, opens its doors for the 2013 season. It's one of the most popular restaurants in town, right on the beach at the edge of Provincetown Harbor, so the view is fantastic. Hours at this time of year are 11:30 AM till about 9 PM. Like most PTown restaurants in the spring and autumn seasons, things here may be a tiny bit different than they are at the height of the summer season. They have such a large menu of seafood, steaks, salads, Portuguese specialties and vegetarian choices that they may not be serving absolutely everything on the menu just yet, but you'll find plenty of great choices, and you should find a current menu posted on the front of the building and also in the west window. Look for "local favorites" marked with a special symbol on the menu. Among my favorites, look for the Pork and Clams Osso Buco, a Portuguese specialty named as a Best Bite by TheYearRounder. The sautéed squid appetizer is another of my Lobster Pot favorites, marked on the menu as a local favorite as well. 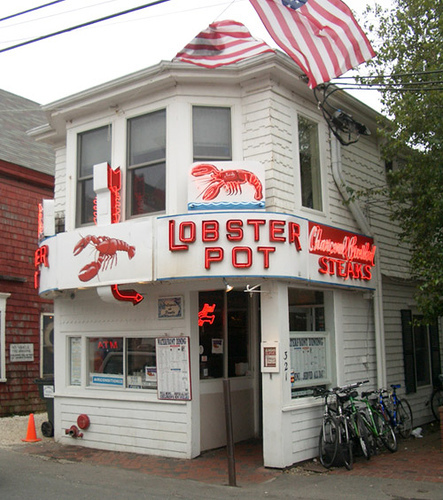 Read my post from September 9th, 2012 about Portuguese food and its long heritage in Provincetown, and then taste some of the best in town at "The Pot." Rob Costa has a favorite here, too. 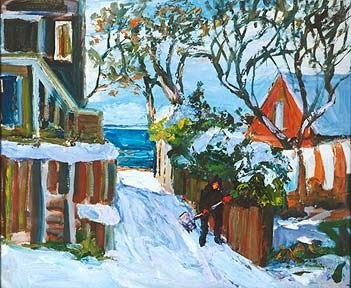 He runs Art's Dune Tours, which is right around the corner from the Lobster Pot, at 4 Standish Street. The dune tours began running tours for the season yesterday, by the way. Anyway, Rob will tell you his favorite dish here is the Portuguese Fish, which is native cod on top of a seafood stuffing with a crusty coating made with linguica (say lean•gwee•suh, a delicious Portuguese sausage) baked with tomatoes and onions and served with orzo pasta. Of course, you'll find lobster here as well, ranging from the lobster bisque to lobster ravioli, served in a parmesan cream sauce with a Panko-parmesan crust, and this spot has a dozen other ways for you to enjoy this most famous crustacean. If you're feeling adventurous, try the full-blown Clam Bake. That's a whole lobster served New England style, with your choice of soups, along with salad, homemade breads, steamed mussels, red bliss potatoes and corn-on-the-cob. Try Tim's famous clam chowder, winner of 18 awards on Cape Cod and in Boston, and chosen by TheYearRounder as another Best Bite. Have a cup or a bowl with your meal, or have it served baked in a bread bowl. Try to save a little bit of room for dessert, though, because there are many choices, and they are are all made fresh in the Lobster Pot's own kitchen. We welcome them back for the summer season. 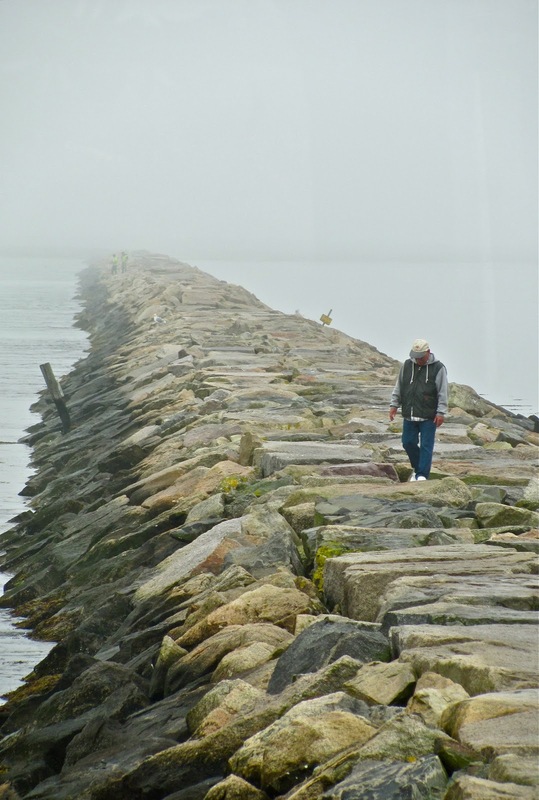 There's still time to be the only one out there for a walk on the West End Breakwater. The signs of spring are all around us as we hear the calls of more and more varieties of birds winging in for the coming season, feel the winter air warming into spring-like temperatures, and see blossoms popping out steadily in the yards and gardens of Provincetown. Soon we'll see the boards come off the windows at Vorelli's, the awnings unfurled at the Mayflower, and the trolley taking its first few runs down Commercial Street to see where the tight spots will be this year. 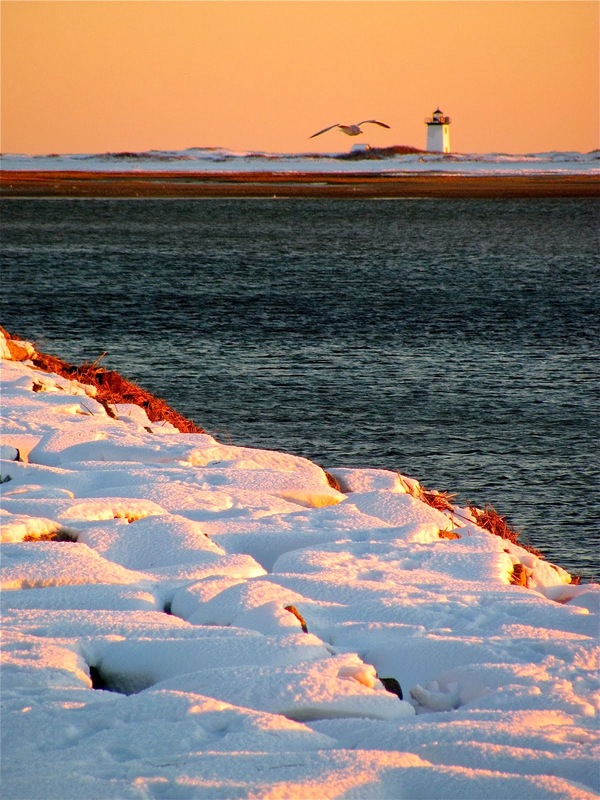 For a short time longer we'll have the chance to enjoy the stunning natural beauty that surrounds us here at the tip of Cape Cod, without all of the visitors that flock here by the thousands in the summer to share it with us. We can still take a ride or a walk on a branch or two of the bike trail and be all alone when we stop near the pond to watch the young geese gliding through the water after their mother. We can hike out into the dunes and be the only one standing at the top of the hill, looking out beyond the tall grasses to the Atlantic Ocean, watching for humpback whales spouting as they amble into the bay to begin the summer season. Walk out into the woods on the old railroad bed at Howland Street and Harry Kemp Way. Sit on the beach near Hatch's Harbor and listen to the waves rolling in and out. Climb to the top of the visitor center, looking out over Race Point Beach, for a 360 degree view of forest, dune and ocean. Even a stroll down any PTown side street will bring you the soft sounds, sights and aromas of the spring as it quietly unfolds all around us. This week, before it's too late, get outdoors and enjoy a bit of blissful solitude, which is all too rare here in the bustling summer season. When a woman and her young daughter open a chocolate shop in a small French village during Lent, the Roman Catholic inhabitants of this little hamlet find their unbending views on morality are flexed a bit as they succumb to the pleasures of these sensual confections. Directed by Lasse Hallström (Cider House Rules,) Chocolat was named one of the best pictures of the year 2000 by the L. A. Times and was nominated for 5 Academy Awards, including Best Picture. Johnny Depp, Alfred Molina, Academy Nominee Lena Olin and Academy Award Winners Juliette Binoch and Judy Dench star in this delightful film that is much more than a romantic comedy. To watch a trailer for Chocolat, click this link, then click on the "watch trailer" button. Then close that window to return to this page. 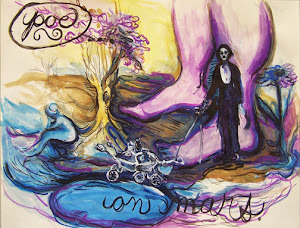 There will be one screening only, at 5 PM this evening (Saturday, April 13th) at Waters Edge Cinema in Provincetown. It can be a little hard to locate this theater if you've never been there. You'll find it at 237 Commercial Street, on the second floor of the Whalers Wharf, although you'll press button number three if you take the elevator. "A Taste of Chocolat" promises to be a grand affair beginning with the film at 5 PM, followed at 7:15 PM by a special chocolate tasting hosted by The Purple Feather, featuring a variety of chocolates from around the world. This event is a collaboration between The Purple Feather, hosting their 6th annual Spring Chocolate Festival, and the Provincetown Film Society, creating community through film. Tickets are $26, giving you admission to the film and to the chocolate tasting, with a portion of the proceeds going to the film society. You can also get tickets for the tasting only. Tickets are limited and will likely sell out. You can also just attend the movie. The Provincetown Film Society brings a tremendous variety of independent features, shorts, documentaries and international films to the tip of Cape Cod year round, and provides screening opportunities for local filmmakers and students, not to mention bringing us the Provincetown International Film Festival in June each year. You can support the society's mission by attending "A Taste of Chocolat," and by becoming a member of the organization. Other events of the chocolate festival include a demonstration by Dutch Chocolatier Paul Kearns, and a scavenger hunt, with a dozen unique chocolate sculptures hidden along Commercial Street. Winners will be treated to a two-night stay at the Surfside Inn, on the water in the East End, or at Sage Inn, nestled in the heart of Provincetown. 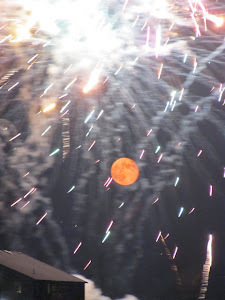 Find out more about the festival on the Purple Feather events page. 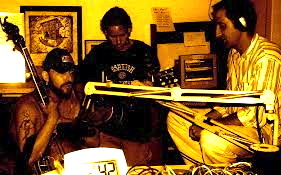 Electric Milk Machine performing live on WOMR's Squid Jiggers program. Click on the link below to hear them play "Whiskey Makes You Friskey" and other tunes. Two local bands will be performing at the VFW tonight, April 12th, at 8 PM, in order to honor the veterans of our community. Click this link to hear Electric Milk Machine perform "Whiskey Makes You Friskey" and other hits of theirs. This terrific little band has been spreading its bluegrass influence around the outer cape and beyond since around 2004 or so. They will definitely get your toes tapping. The Daggers, a very popular PTown band, will be on hand as well with their blend of "classy rock and roll," promising to get you up on your feet and dancing. This will be a great excuse to get out of the house, have some fun, and perhaps a beverage or two. See you at the VFW, on Jerome Smith Road. is the most popular pastry in Portugal, and a PTown favorite. Yippee! The world-famous Portuguese Bakery has just re-opened for the 2013 season, bringing back all the yummy treats they are so well known for, although not everything on their usual menu is available quite yet. But as we get a bit farther into the season we'll find close to a hundred different pastries, both sweet and savory, available at any given time. The hazelnut torte, for example, won't be in the pastry case for a few more weeks, when we've got more visitors in town. But for now, lots of your favorites are back, and if you've never tried the Portuguese Bakery you'll have a hard time choosing a favorite treat. Of course, no trip to Ptown is complete without sampling the malassadas, the Portuguese version of a light, tender dough that's deep fried until it's puffed and golden, then rolled in sugar and left to cool a bit on a rack seen through the front window of the shop. You can watch them being made, and ideally, you'll arrive just as they are being set out to cool, which is when they are at their most delicious. 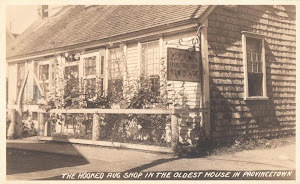 The Provincetown Portuguese Bakery, at 299 Commercial Street, started baking bread for local restaurants well over 100 years ago, and in 1976 the front section of the building was opened to the public, selling their legendary breads, along with pastries and sweet treats. Nowadays you can also get a number of savories as well as sweets, like the linguica roll ( say leen•gwee•suh) which is made with a slightly spicy Portuguese sausage. You can also get breakfast or lunch from their grill. A bacon and egg breakfast, for example, is an inexpensive way to start your day right in the center of town.This is a counter service restaurant, and you are asked to bus your own table, which helps to keep the prices low. Right now they're open daily from 8 AM till roughly 3 or 4 PM, depending on business. In the summertime their hours will be greatly extended. Whether you need breakfast, lunch, a tasty treat or a full-blown wedding cake, check out the Portuguese Bakery.